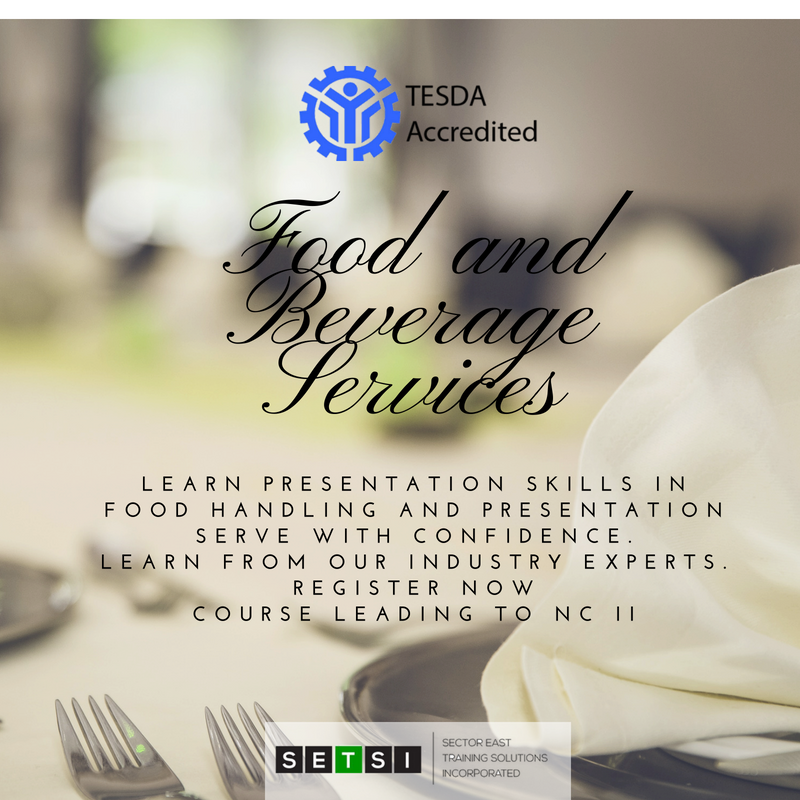 Sector East Training Solutions Inc. (SETSI) is a Technical Vocational Institution accredited by TESDA to offer TVET Programs for Food and Beverage Services NC II. Our school is located at Sta. Elena, Markina City. What is Food and Beverage Services NCII? The food and beverage service is part of the service-oriented hospitality sector. It can be a part of a large hotel or tourism business and it can also be run as an independent business. The members of the F&B Services team are required to perform a wide range of tasks which include preparation for service, greeting the guests, taking their orders, settling the bills, and performing various other tasks after the guests leave. Sector East Training Solutions Inc. (SETSI) is offering a TVET Program for Food and Beverage Services NC II. - Apply a systematic approach to the research, design, planning, implementation, and evaluation of festivals and community events. The Food and Beverage Service program prepares you to start an international or local career in the hotel, restaurant, or bar business. You will learn restaurant and banquet service techniques. Professions after the program may lead to being - ushers, wait staff, banquet servers, professional butlers, and event staff.